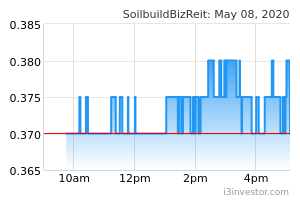 Soilbuild REIT is a Singapore-focused real estate investment trust (“REIT”) with a portfolio of business parks and industrial properties used by industries engaging in manufacturing, engineering, logistic, warehousing, electronics, marine, oil & gas, research and development and value-added knowledge-based activities. Its portfolio of properties includes Solaris, a landmark development in one-north, Eightrium @ Changi Business Park, Tuas Connection, West Park BizCentral and Bukit Batok Connection. Soilbuild REIT’s portfolio has a net lettable area of 3.90 million square feet and an occupancy rate of 92.7% as at 31 December 2017. Siew Jian Bin Anyone invest in this counter? NicholasNWH90 Why the sudden drop? Hmm. NicholasNWH90 S$0.74 - S$0.01557=S$0.72443 And now it is 0.715. Didnt know that many investors in SGX don't know how to do the maths as well. Gave me a shock just now. sunbird It nearly always does that. Its a weak market. Next quarter it should be a bit better if they can get more tenants. prince_mk98 I m holding some of the reits too :( let see how it goes next month. sunbird bought accord earlier this year, two payouts a year. First payout very soon, about 4 cents plus, trading at 61 cents, do the math! NicholasNWH90 Sunbird what accord do u mean? NicholasNWH90 Ohh it is ACCORDIA GOLF TRUST. You boought low at below 0.5? sunbird yes. Started to buy below .50. average now .53 cents. I shall sit on this one for at least a few years. NicholasNWH90 Good one. Now the price is rather high already. NicholasNWH90 DBS: Soilbuild Business Space Reit reported 1Q16 DPU dipped 4.7% y-o-y; in line with expectations. With yield of c.8.4%, one of the highest in the S-REIT universe, we believe that negatives are priced in and SBREIT remains an attractive laggard play among peers. 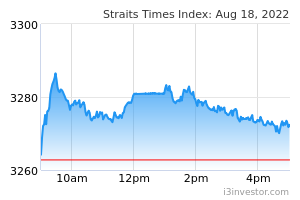 Maintain BUY, TP S$0.84. prince_mk98 Can still keep or shall I divest into other reits? I have few with me. sunbird Just keep it. Don't chase stocks. This reit is not going bankrupt. If it goes down further, it may be time to buy more, I will. prince_mk98 Soilbuilder and Aimsamp. Both are also into industrial field. Why Aimsamp is moving upwards trend and Soilbuilder was lagging behind?